What I Wore: 12/26/11 | Oh Sarah O ! Twas the day after Christmas and throughout the day, Sarah was stirring on her vaca(tion). After Christmas I decided to bust out a comfy red and white combination outfit to demonstrate that I was still feeling festive while I enjoyed my day off from work. 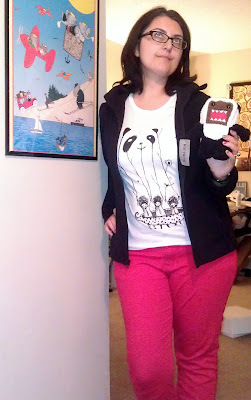 I wore another t-shirt by my favorite t-shirt company, Threadless (see this post for another Threadless tee). The shirt in this picture is called "Fake Pandas Have More Fun". I guess I was hoping that some of the fun happening in my t-shirt would wear off on me. You can't see it in the photo, but I also painted my nails for Christmas. I purchased some OPI Muppet themed nail polish in "Fresh Frog of Bel Air" and painted all but my ring fingers with it, which I painted red. Since it's a glitter polish, it took several coats to give my fingers the glittery goodness that I wished to achieve, but so far this polish has lasted into the new year. 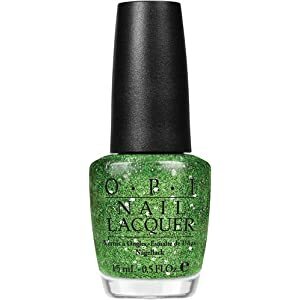 I was hoping that this polish would inspire me to check out the new Muppet movie over the holiday, but The Boy and I have not been able to tear ourselves away from the Netflix yet, so don't spoil it for me.